Goldsmith & Eggleton has invested in a complete renovation of its Mill Room. The project will be finalized and ready for production in early January 2009. 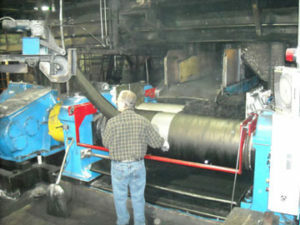 Details of the renovation include the installation of new dual-drive, unitized 84-inch batch-off mills outfitted with PLC controls and ancillary electric and temperature controls. These new mills will be incorporated with the previously installed F-270 mixer to create a state-of-the-art masterbatch mixing system. The new technologies will also allow G&E to expand its current product line by giving the company more versatility of materials processed to expand into new markets. The G&E masterbatch operation will supply products to compounders, custom mixers and processors. “The Mill Room renovations will continue to help G&E contain production costs without sacrificing quality for our customers. By expanding our capabilities, we look forward to the challenges of entering into new partnerships with value-added material solutions,” added Rob Eggleton, Vice President & Manager of Sales and Marketing.